A propeller blade from a crashed World War II Lancaster bomber will be unveiled in a Highland cemetery on Sunday as a memorial to lost airmen. Six Royal Australian Air Force personnel and a RAF crewman died when the aircraft came down on Balavil Estate, near Kingussie. 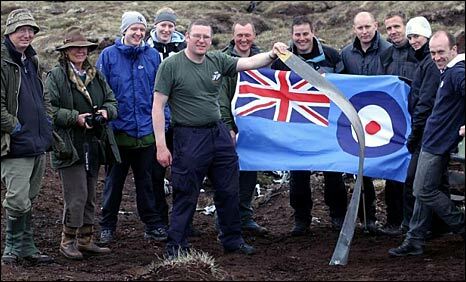 A team from RAF Waddington, Lincoln, from where the bomber flew missions, recovered the blade. It has been erected in the graveyard at Balavil House. The estate owners - Allan and Marjorie Macpherson-Fletcher - have been protecting the crash site of PD259 from souvenir hunters. It will be unveiled on the 64th anniversary of the crash. The crew from 467/463 Sqd were on a night training flight over the Cairngorms and Monadhliath mountain ranges when the bomber came down. The cause may have been damage as a result of anti-aircraft fire, or freezing conditions, encountered during a mission the previous night. Once removed, the propeller was transferred to RAF Waddington for restoration. It will act as a memorial to the 1,306 personnel of 467/463 Sqd lost during World War II. The six Australian crew members of PD259 were interred in the Commonwealth War Graves Commission cemetery in Cambridge, while the sole RAF airman was buried in Glasgow.